Us foodophiles love to add things like “cook more” and “bake more” to our list of things to do more of in the New Year. Or maybe you just want to try some new foods in 2015. Whatever your goals, they’re probably totally doable. The hard part is putting an action plan in place. This is how to go about making your goals, resolutions, whatever you want to do, come true this year. 1. Make it specific. Do you want to go through the whole Joy the Baker Cookbook? Do you want to eat five new fruits? Do you want to visit every gastropub in Austin? The choice is yours, but you have to know exactly what you are wanting to do or it will be very difficult to accomplish your goal. 2. Now that you know what you want to do, figure out how to do it. Say you do want to make every recipe in a book. Count how many recipes are in the cookbook and divide by the numbers of months or the number of weeks to determine how many recipes you should make each week or month depending on whether you want a very strict plan or more of a guideline. You know yourself better than I do, so you’ll be able to figure out which is needed on your own (Trial and error helps). 3. Share your goal. This really helps with follow through. Maybe start a blog to show your progress and let friends follow along. Maybe start a Twitter account for your resolutions or goals. Goals are something you want to accomplish and have a beginning and an end. 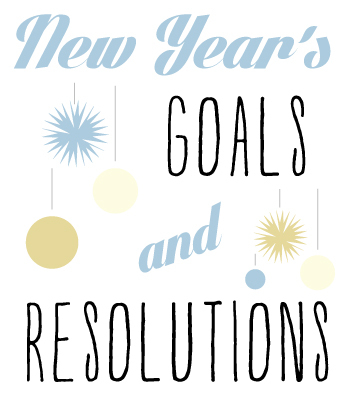 Resolutions are something you want to start doing or quit doing. More like a habit. I think it’s great to have both. Try an exotic dish you’ve never tried before. Eat the required amount of fruits and veggies per day. Stop eating milk, cheese, meat or grains. Watch the all-time top 10 foodie movies according to epicurious. Happy New Year. I hope you all have the tastiest, sweetest, juiciest year ever!